Sardar Vallabhbhai Patel (31 October 1875 - 15 December 1950) was a lawyer and influential political leader in the Indian independence movement. After independence, he was crucial in the integration of over 500 princely states into the Indian Union. He was deeply influenced by Gandhi’s ideology and principles, having worked very closely with the leader. 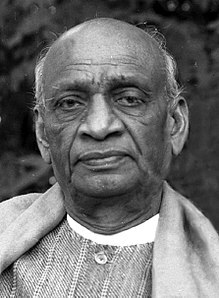 Despite being the choice of the people, on the request of Mahatma Gandhi, Sardar Patel stepped down from the candidacy of Congress President, which ultimately turned out to be the election to choose the first Prime Minister of independent India. He was the first Home Minister of Independent India and his uncompromising efforts towards consolidation of the country earned him the title ‘Iron Man of India’. Sardar Vallabhbhai Patel's health started declining in 1950. He realized that he was not going to live much longer. On 2nd November 1950, his health deteriorated further and he was confined to bed. He died on 15 December 1950 after suffering a massive heart attack. 1991 - He was awarded the Bharat Ratna, India’s highest civilian honour. 2014 - His birthday, October 31, was declared Rashtriya Ekta Divas. 2018 - The Statue of Unity dedicated to Patel is unveiled as the world's tallest statue. This page was last changed on 13 February 2019, at 00:02.